I had a trampoline when I was a kid. So I’m biased. I love jumping. In fact, the only reason I stopped using it when I was about 17 was I started bottoming out. I’d bump the ground when I did a hard enough back bounce. It didn’t occur to me at the time that I could dig out 12″ of the sand under it and keep jumping. Anyway, plyo boxes are the next best thing. They’re a staple piece of equipment in Crossfit gyms and sports training facilities that do plyometric training. As with anything training-related, you’re better off starting with an easier model than you (or your athletes) can handle. You want to learn good form, and you’ll sacrifice your form and/or cause injury if you start off with too much effort to jump up onto a tall plyo box without warming up, learning the correct movement including arm swing, and conditioning yourself for the explosive movement. It takes time to perfect it and stay consistent. So take it easy to begin with and get a size that you can drill before moving up to start testing your limits. Box jumping is often done as a conditioning exercise, so when doing it that way you can use a shorter box and see get lots of benefit from it. You will be able to continue your workout with a shorter box when you would have to stop with a taller box because you’re getting too tired and the big jump is starting to get too dangerous. The major injury is missing the top, clipping your toe, and gashing up your skin on the the top edge of the box. There are ways to mitigate this with different types of boxes. Still, this falls into the category of activities where you should ask, “How do people get hurt doing this, and how do I avoid it?” I’ve learned that the hard way with some sports. Max attempts for height are a different deal than conditioning, and you will be working up to that slowly enough that you’ll utilize the shorter plyo boxes plenty, so you don’t have to worry about that if you’re reading this article. Most men can start with a 20″ box. Women can start with a 16″ box. If you’re shorter than average, out of shape, or heavy, don’t feel bad about starting with a shorter one. 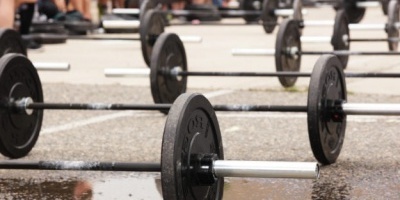 Crossfit WODs prescribe 24″ or 30″ heights as a standard height for doing then “as rx’d”. Beyond just doing workouts, if you want to improve your jump height, you’ll want to work up to heights by doing a ton of reps at lower heights until you get used to it and get a feel for when you just can’t do another rep safely. It’s much like warming up with steadily higher weights when doing heavy squats. With each workout you have to start low and get your muscles primed for the big jumps. In the past your only choice was a fixed height plyo box. Now you have a few options. This is the classic style. For group training environments, steel plyo boxes can still make the most sense, because you can pile a dozen of them of different sizes in a nested stack for efficient storage in a corner. 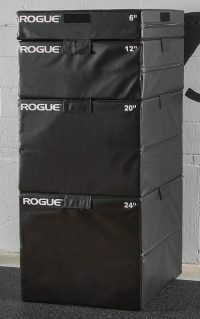 You can get them from Rogue, or if you don’t need higher than 24″ then you can get the j/fit steel plyo boxes on Amazon for a lower price. We sell some nice ones that go up to 42″ and currently are a little cheaper than Rogue with shipping. For just yourself or a limited number of athletes you can get wood plyo boxes that can be flipped around on any side, and each side is a different length. Most commonly they’re in 20″ x 24″ x 30″. It’s tough to find anything bigger than that. A 20″-30″ range isn’t huge. These boxes are mainly meant for high rep WODs, not for challenging your jump height. The other issue might be that they need to be used on rubber flooring. Wood slides too easily on a concrete, wood or pergo floor. The last thing you want is to worry about it being stable. So for example a box may come in dimensions of 20″ x 24″ x 30″, and you flip it over to do any of those heights. A smaller version is available where you can do 16″, 18″ or 20″. We actually recommend the larger box because the smaller one isn’t as stable when you tip it up to be 20″ tall (and only 16″ wide). 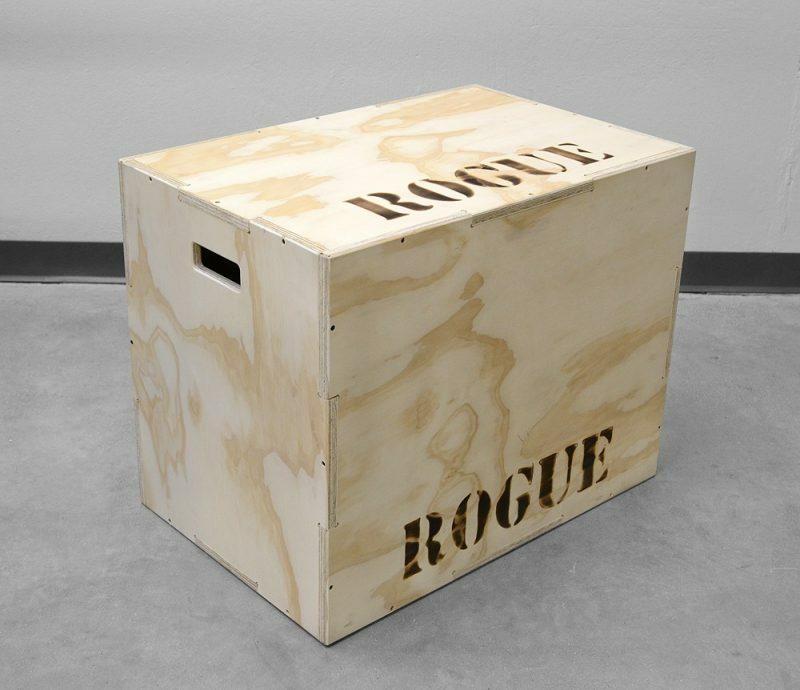 Other wooden plyo boxes are stackable, made to start as low as 8″ and go up to a recommended max of 32″ safely. Rogue rounds off the edges of the wood to help reduce bloody shins when you miss a jump. But if you make or get a hold of another brand with sharp edges, round off all edges with a wood file. It’s well worth your time. Any taller than 30″ and you’ll need to see about buying a different type of box. You can get a wood cube from Rogue. Rep Fitness is another trusted brand. These are meant to be much like wood plyo cubes, but they save your shins when you miss a jump. The extra security helps you go for those max jumps without much fear. The foam is nice and stable and it has no weight limit. 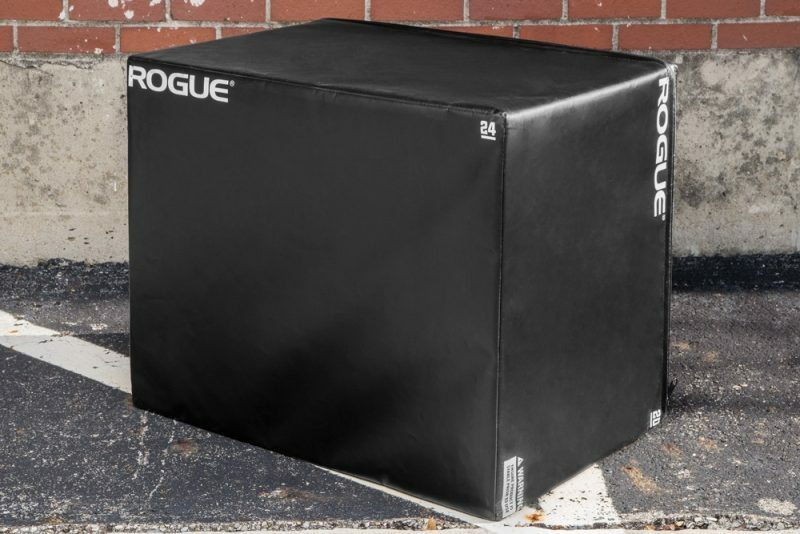 Rogue sells one, and we sell the Body Solid model. Easily my favorite. They are stackable boxes of varying heights and velcro strips, and you can stack them up to any height. Like the soft plyo cubes, the soft but firm texture adds a huge dimension of safety to what is ordinarily a risk of injury when you miss a jump and hit your shin. The best thing to do is get one of each height for a complete set you can adjust to any height. If you find you can jump higher than you thought, you can always get one more box later. Rogue sells them in several heights from 6″ on up. I’d rather go up in 3″ increments. Perform Better has a set that starts at 3″. People have also done some interesting things like stacked bumper plates up on a steel pole of the right height so that they don’t move, and the bumpers are a bit more of a forgiving edge if you fail the jump. This may require at least one person to hold the precarious pile steady.